Maker of Special Tricks, Illusions, and Stage Equipment. 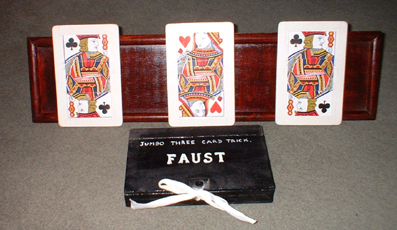 A Granville Taylor Publication: "THE EVOLUTION OF FAUST". The Autobiography of Granville Taylor. Now published in a limited edition of 250 copies. Price: £45.00 plus £6.00 U.K. postage. Airmail U.S.A.: £14.50. Europe: £7.50. See Evolution of Faust page on this site for details of contents of the book. A Corner of the Attic Workshop. Photograph by Greville Worthington. November 2010 on his visit to buy "The Devil's Birdcage" and "Tip-Over Dove Vanish Box". 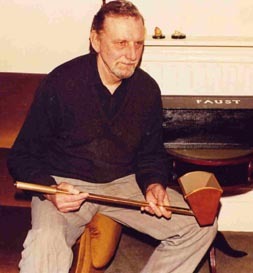 (Both items made by Granville Taylor and used in Faust's Great Magic Show from 1968 onwards, together with the Taylor-Made "Crystal Casket & Stool") . 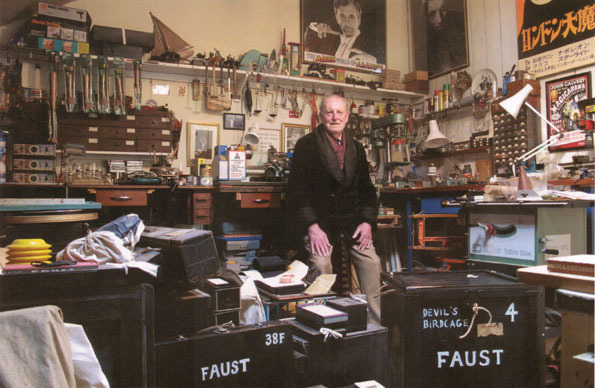 Faust has sold all the equipment in store for his GREAT MAGIC SHOW to a buyer in Spain. He has sold all his John Martin equipment, to a buyer in the U.S.A., and all his remaining stage costumes plus velvet drapes and scenic cloths as one lot to a buyer in the U.K. 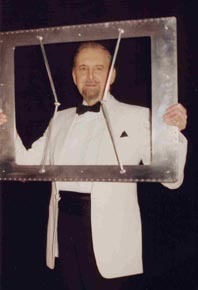 Tricks, illusions, close-up magic, magic books, memorabilia, DVD's and stage equipment still for sale, are listed, with photographs on http://www.taylormademagic.co.uk/. 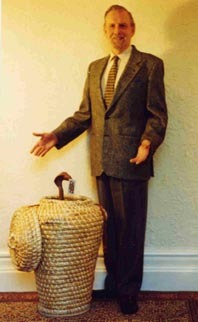 Faust's Snake Basket. Modified wind-up gramophone motor mechanism. Rising and falling mechanism designed by Faust's friend, the late "Marco". 15 months to make. For sale. £1,250. SOLD. Thin Model Dove in Balloon. Thin Model Dove in Balloon. Taylor-Made. £120. SOLD. 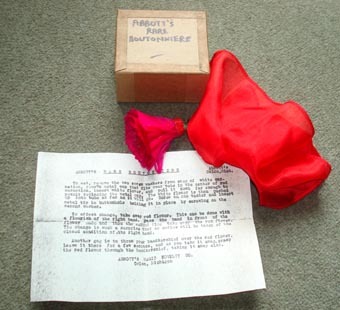 (Similar to the one used by The Great Lyle in his "The Cunning Bunny" routine for exchanging a borrowed watch in an envelope for another envelope containing just a silk handkerchief with a small watch sewn into one corner of the handkerchief. Boy from audience held the envelope to his ear to confirm the borrowed watch was still there, whereas it was off-stage with the Lyle assistant to attach to a ribbon tied around a rabbit's neck). SOLD. Stanyon's Jumbo Size 3-Card Trick. 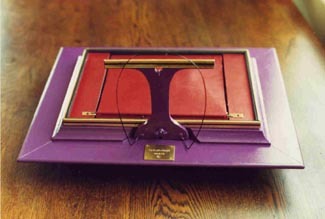 Vintage Stanyon's Jumbo 3-Card Trick, with Taylor-Made Display Stand. Cards are in a "scrimmed" wooden travel box. Display stand is in another "scrimmed" wooden travel box (not shown) together with the card box. £60. SOLD. Glass Penetration Frame. Taylor-Made. Based upon the original Chris Charlton model, but much larger, and made from "Dural"with an improved design so that it looks like the glass is riveted into the frame. 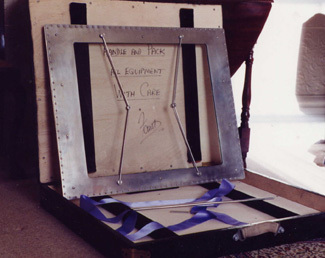 Complete with "Dural" rod, long ribbon, and its own padded travel box. Unique. £250. Tom Yurasit's "STUCK IN TIME"
A "Flying Ring" routine with a difference. 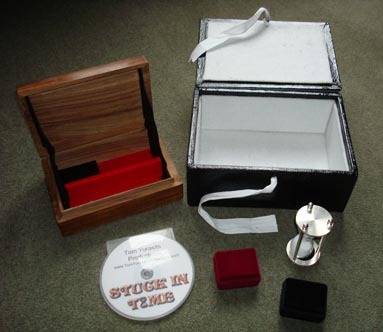 A borrowed finger ring vanishes from its black box, but fails to re-appear in the red ring box. Faust the Magician explains that it must have got stuck in time, and sure enough, the borrowed ring is seen inside the hourglass timer. The device is unscrewed and the ring returned to its owner. £200. 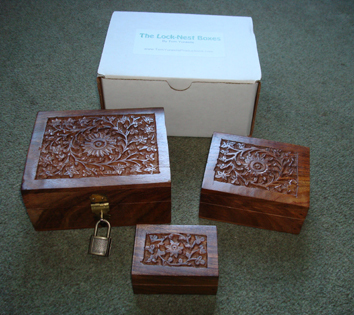 The "Lock-Nest Boxes" (Tom Yurasits), £150. Requires use of a "Flying Ring" reel. A red rose in the performer's buttonhole changes to a white one as a silk is held in front of it for a second. £50. 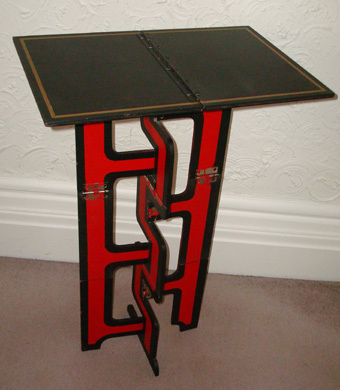 This is an original Harbin " Packaway Table" made by Eric Lewis around 1946. Heavy wood construction with heavy brass spring hinges......the original vintage professional model. Someone has applied large plastic letters, MICKEY MOUSE MAGIC BOOK, on the bottom/back of the folded table, which adds to the novelty. 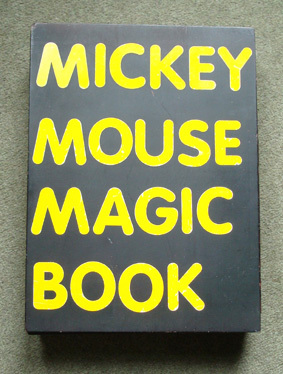 Display the Mickey Mouse Magic Book, then.....WHAM! The table just appears and locks automatically. It is set down on the floor to be used as a regular magician's table. £150. My first trick! 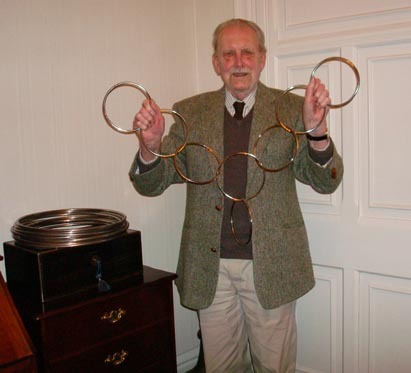 Routine taught to me by my Uncle Arthur Nash, with 6" Linking Rings I bought from Will Goldston's Magic Shop in 1940. 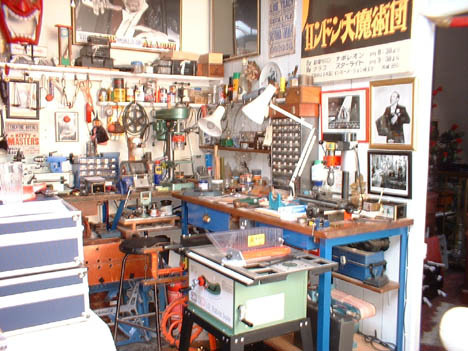 On the writing slope on the left is a 15" stainless steel set that I had made for me in Osaka in 1971 for playing the huge theatres in Japan. (Photographed November 2009). 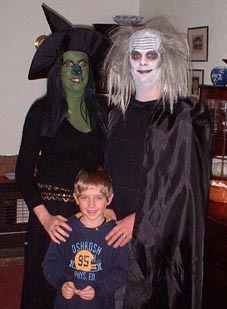 My younger son, Jamie, with his wife Geraldine and their son Lewis ready to depart for a Halloween party. 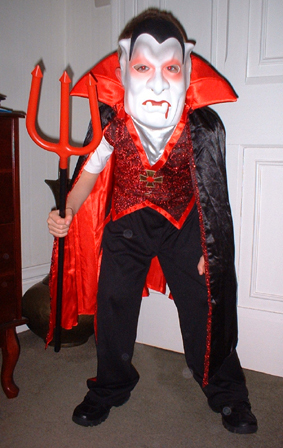 At another Halloween party, my grandson Lewis gets in on the act as Dracula. 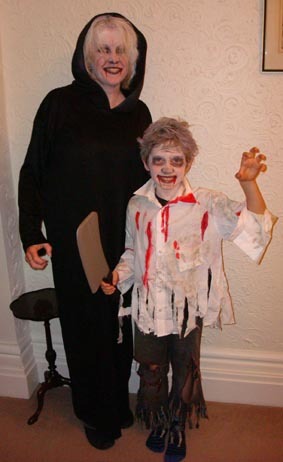 Third photograph of Lewis and Geraldine, taken 31st.October 2009 on their way to another Halloween party.